I’ve always regarded Theme Hospital as the odd one out when it comes to Bullfrog’s strategy games. Theme Park made all the sense in the world, even when I was 11 years old, but I just didn’t understand the concept behind Theme Hospital. Even now I think running a for-profit hospital was a really weird theme for a British developer to build a game around; unfortunately the severe cuts the NHS has suffered over the last decade has given private healthcare the opportunity to become more deeply entrenched in the UK’s healthcare system1, but back in the 90s it was still a deeply alien concept to the British psyche and I often wonder how exactly Bullfrog ended up deciding to make it. 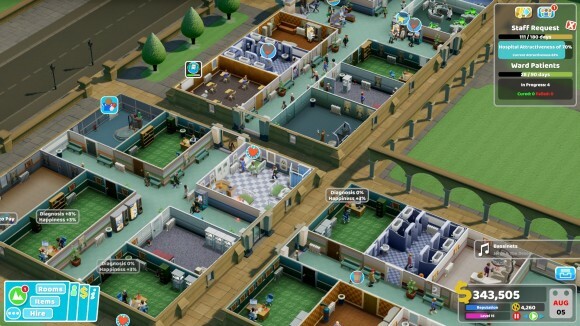 Odd choice or no, though, Theme Hospital remains one of Bullfrog’s most fondly-remembered titles (for those who actually played it, at least), and so it’s no surprise that it’s the latest one to receive a modern attempt at a do-over in the form of Two Point Hospital.